I had heard about it, read about it in Property Scope, but I hadn't seen it myself until last night. One of the vestiges of a west Knoxville long forgotten except by those who grew up there from the 40's to the 60's (harder to find than you'd think), fell victim to the bulldozer. It's going to be a Chick-fil-a. The building was unloved, forgotten, and largely ignored by all of those BMW's and Escalades zipping by on the pike. It was the kind of place that polite society might want to pretend didn't exist next to the Starbucks and posh boutiques. It contained Opal's lounge, a sort of rowdy, blue collar place with impossibly cheap beer. There were rusting Oldsmobiles on jack stands and a tarped roof. You had to look pretty hard through the overgrown bush to see all of that, but it was there. I didn't think anyone else would notice, but I was wrong. Making my way through the impersonal, robotic, self-checkout lane at Kroger, I heard a woman of a certain age, who was wearing a fur coat and a fur, leopard print hat, exclaim that "they wouldn't be satisfied until they had paved over everything." This, of course, piqued my interest. She was talking about the Biltmore Court Motel and ranting about the trees. 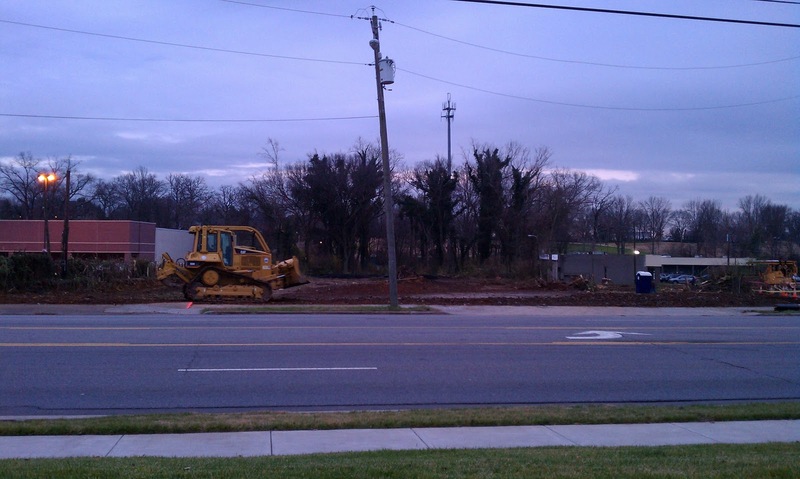 She couldn't believe that they had torn it down and then bulldozed all of the trees. I couldn't either and I couldn't believe that a person in Kroger, west of Sequoyah, shared my concerns. But she was right, the Biltmore, despite its recent history, had been a lovely place. Once the site of Bill's Drive-In. That is the original sign, note the neon star. It has survived all of these years and is likely headed to the landfill. That great neon-sign was removed in March 2011. I wonder what happened to it. 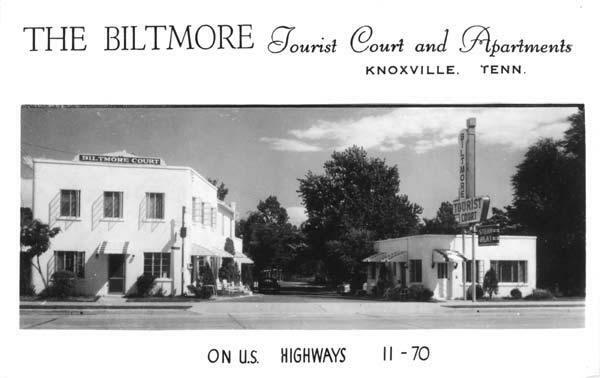 The Biltmore was a "motor court" built in the 1940's, some say 1949, during a time when Kingston Pike, US 11/70, was the main east/west thoroughfare in these parts. Kingston Pike was lined with these sort of places, places that ushered in the glory days of American motoring. 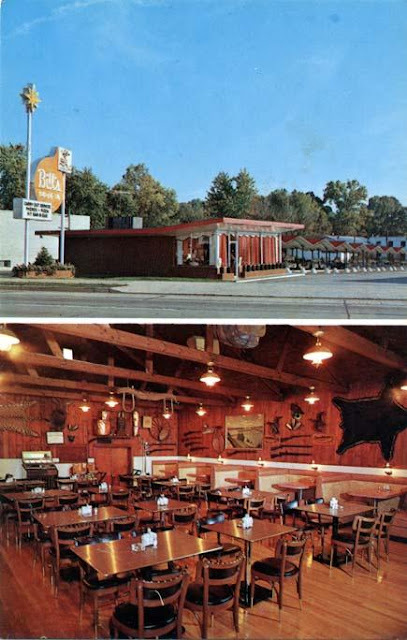 There were service stations, restaurants, and a stretching line of motels. Most of them are now gone, some of them have been re-purposed. There was the Colonial Tourist Court, next door to the Biltmore, it's now a parking lot and a Starbucks. The Colony Tourist Court with its gas lamp inspired lighting, served for many years disguised as Colony Square, a shopping center/office building. It's now home to a shopping center that contains Vibe, @Home, and the former WokHay. Another old strip motel exists next to the 37919 post office. I haven't been able to determine what it was called. It houses offices and a paper shop. Further west, there was the Terrace View Motor Lodge. It looked like the kind of place a James Bond villain might have stayed with its super crisp, modern lines. It was bulldozed in the late 90's to become the Nature's Pantry and Well Nutrition (across from Calhoun's on Bearden Hill). The Mount Vernon, onward west, is now a Mattress store. Out near Gallaher View Rd, there is the Time Out Deli. It is located in the front portion of what was once Sharp's Motel and Grill. Aside from the motels, there were roadhouses, eating establishments geared to the motoring public. One success story, against all odds, is the Highlands Grill. Heading west on Kingston Pike, just past Western Plaza, Old Kingston pike shoots off to the left at Bearden Beer Market (another successfully re-purposed building). Just behind the shopping center containing Long's Drug Store, the road shifts back to the right, and cuts over the railroad tracks to rejoin Kingston Pike. This was once the alignment of Kingston Pike and in that curve over the tracks, was located the Highlands, one of the first roadhouses. It operated from the 30's until the 60's but was then preserved as Andrew Morton's Gift Shop. It has recently been renovated and returned to restaurant service and it is an excellent experience if you haven't been there yet, The Grille at Highlands Row. Next to the Biltmore, was Bill's drive-in. It was a drive in restaurant that also had a dining room with a very western feel. Bill's was torn down years ago, but the platforms for the drive-in portion remained. They were bulldozed along with the Biltmore last week. Across from the Biltmore was the Dixieland. Some will remember it as Pero's Italian restaurant. 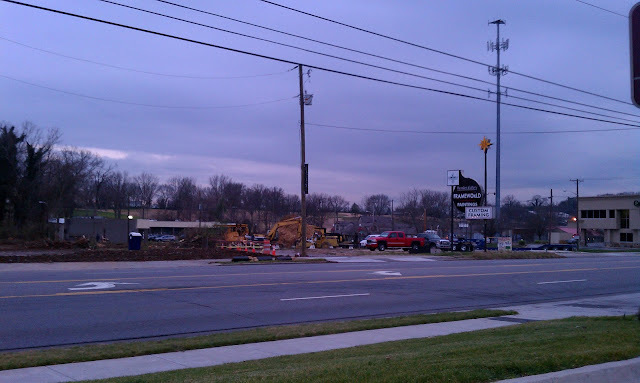 Most younger folks will remember it as where McKay's bookstore used to be. It was bulldozed and is now a bank. There were many, many more. Bill's Drive-In. There wasn't much left except for the sign and some foundation pads. I wonder if the "Save our signs" campaign has looked at saving this one. It might be there a few more days. While all of these places were predecessors to what is now replacing them (Chick-fil-a's, Courtyard Hotels, Walgreens) they had something that none of these new places possess, individuality. These were Knoxville establishments, uniquely so. Sure, other towns had drive-in restaurants, but only Knoxville has the Pizza Palace. Every town has a Starbucks and each time a place like the Biltmore is bulldozed to become another chain restaurant or big box store, Knoxville loses another piece of its distinctiveness. The Homberg neighborhood, a unique part of Knoxville, now looks a little more like Cedar Bluff. It's a march toward becoming Anytown, USA. The woman in Kroger was right though, the Biltmore really was once a very lovely place. I cant believe they tore those buildings down. That community just lost some of it unique great structures with great historical presence. That is horrible. And now a stinking $hit-fil-a sits there! As a child/teen in the 1940s and 1950s the most important establishments along that part of Kingston Pike were the Dixieland Drive-in and the Pike Theater. The Pike Theater building still stands. I couldn't find the Dixieland. They made the best hamburgers. There was a drive-in movie theater along there, too, across the Pike from the Long's Drug Store shopping center. Alhambra Court was the one you couldn't locate/identify, there at the Bearden P.O. I remember it as where Olan Mills was located in a converted building, where we kids were dragged for photos! I don't know. The Alhambra was a collection of separate buildings, this place (now housing Archer's BBQ) is more of a row. I want to say it was called the Cherokee Motel, but I am not committing to that. Several of these places documented a bit here.